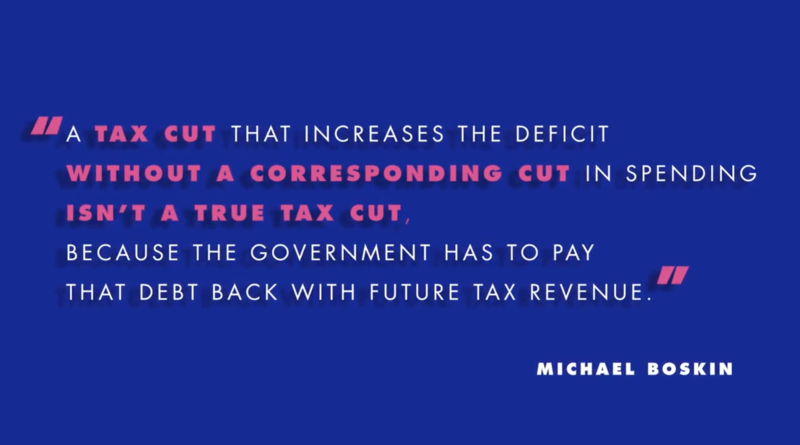 In this video, Michael Boskin makes a fundamental point when it comes to any deficit-increasing tax cut: Unless there is a future way to pay for the new debt created, a tax cut isn’t a tax cut unless it is accompanied by spending cuts. While many believe that any tax cut is good for the economy, it must be offset by the costs it imposes in the future. The primary purpose of taxation should be to raise the revenue necessary to finance government spending. And federal spending is projected to grow considerably in the future. Deficit-increasing tax cuts could have the inadvertent effect of leading to a debt crisis, and ultimately slower economic growth. Of course, lower tax rates have the effect of increasing take home pay and the return to work or investment, leading to higher growth rates. The goal is to reach the right balance when it comes to tax reform. Unfortunately, projected spending in 2040 is so large that income and/or payroll taxes would have to rise so much that many middle-income families would face marginal tax rates of over 60 percent. That means reforming our current tax system must be complemented by spending control. Tax systems with broad bases and low tax rates are the most effective foundation for an efficient, growing economy, and we should keep that in mind for future tax reform. While consumption taxes are efficient, all forms of taxation should be considered as long as they are revenue-neutral and accompanied by rigorous, enforceable spending controls.